MOOCs are short web-based courses. They are free and anyone with a computer can easily access them. MOOCs help students to engage in a topic in different ways. They can watch videos, read articles, and examine media pieces suggested by the MOOC leaders. They can get involved in discussion boards and share resources. They can develop new online resources and participate in learning activities. 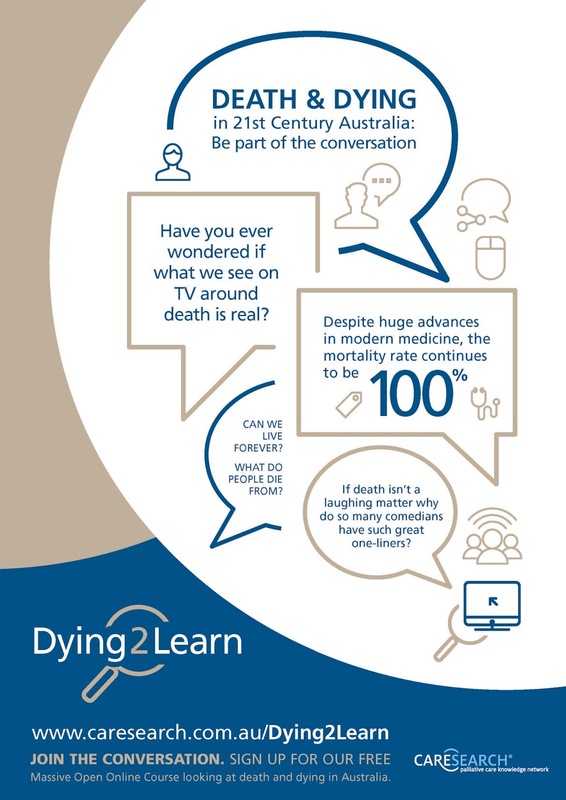 The purpose of the Dying2Learn MOOC is to build community awareness and foster social discussion about death and dying in Australia. The Dying2Learn MOOC will explore social and physical issues around death and dying, and look at how concepts and representations of death have changed over time. How does today’s society engage with death and dying? How do we use language to describe it? What does death ‘look’ like? How is death and dying portrayed in the media? If death is the problem, is medicine the answer? A look at what we die of, the role of medicine, and prolonging life versus prolonging death. Digital dying: Death during the internet-age.